Powder Mixer offered comes designed and developed using attest technology support and provides for perfect support as mixing systems. 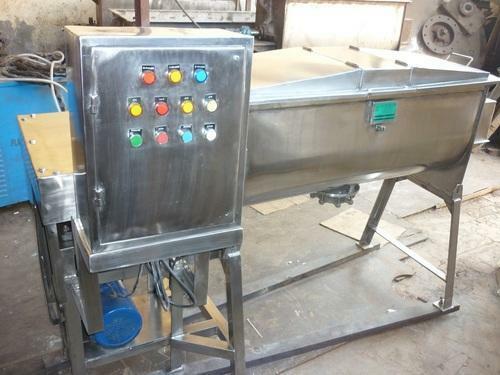 We can make these available in different operating volumes with the system capable of handing blending requirements of wet and dry ingredients. Provide for consistent, homogeneous product. For years now Fans Bro Erectors has earned the reputation of providing our customers with unmatched quality and project completed on schedule and under budget. We offer Heavy Industrial Fabrication, Plant Fabrication, Industrial Structural Fabrication & Erection for Refineries, Nuclear Plant, Food Processing Plant and Dairy Plant. Earlier in our service life we had held responsible posts in renowned engineering companies. The firm was started as a proprietorship firm Mr. C. R. Phansakar in the name of Fans Bro Fabricator and converted into partnership in 1998. We also offer Fabrication & installation of SS, MS piping along with miter bend fabrication with SMAW/GTAW process.